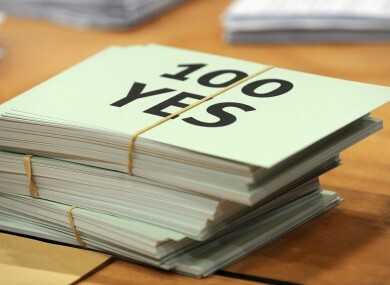 IRELAND WENT to the ballot boxes on Thursday to decide whether to adopt the European Fiscal Compact treaty. Here, in no particular order, are some random statistics about who showed up, and what they chose. 3,144,828 – The number of Irish citizens over the age of 18 who were registered and entitled to vote in Thursday’s referendum. (There were 3,843,601 living Irish citizens, according to last year’s Census). 29.47 – The average number of votes cast, per second, during the 15 hours of polling. Voting began at 7am and continued right up to 10pm. 33.63 – By comparison, the number of votes cast per second in the second Lisbon referendum; there were 30.02 votes cast per second in Lisbon 1. 20.81 per cent – The proportion of the country’s population (again, as of Census 2011) who actually voted in favour of the Fiscal Compact. 68.5 per cent of the population were entitled to vote; 34.7 per cent actually voted, and 20.8 per cent approved it. 1 – The number of constituencies whose Yes vote rose in this week’s ballot, when compared to Lisbon II. That was Mayo – the home patch of Enda Kenny – which had a 61.7 per cent Yes vote in the second Lisbon vote, rising to 67.2 per cent on the Fiscal Compact. -13.5 per cent - The amount by which the reverse was true in Laois-Offaly, which saw its Yes vote sink quite a bit when compared to Lisbon II. To be fair, though, Laois-Offaly was among the top 5 Yes voters in 2009, perhaps indicating that taoisigh are good at getting stuff passed. 5 – The number of constituencies, out of 43, which voted against the Fiscal Compact. That number includes the two Donegal constituencies, which were the only ones to reject Lisbon the second time around. 0 – The number of constituencies which also had lower turnouts than the two Donegal ones. North-East had the highest rejection of the Fiscal Compact, at 55.6 per cent, while South-West had a turnout of just 41.9 per cent – with only 26,465 of the 53,127 registered voters showing up to vote. 13,931 – The number of people in Dublin South who must be feeling fairly left out in the cold. They were the ones to vote No on Thursday – but, numbering only 24.2 per cent of their constituency, they were on the wrong end of the biggest defeat in the referendum. That’s the constituency of late-to-the-game Treaty opponent Shane Ross, incidentally. 57,896 – The number of people who actually voted in Dublin South, which – in absolute terms – had the highest turnout of any constituency. Proportionally, Dublin North Central had the highest turnout at 58.8 per cent. 25 – The number of constituencies (again, out of 43) which approved the Treaty by more than the national average – with each of them voting Yes by over 60 per cent. 7,206 – The number of spoilt votes cast in Thursday’s vote. That’s up on the 6,171 from Lisbon I, but slightly down on the 7,224 from Lisbon II. 0.64 per cent – The proportion of votes in Tipperary North which were spoilt. That’s approximately 2 votes out of every 300 cast. Tipp North voters were the most prolific spoilers of the ballot. Dublin South-West had the lowest spoils, at 0.3 per cent – just 106 out of its 35,665 votes cast. -21.9 per cent – Tipp North’s other single standout fact in the Fiscal Compact referendum: its turnout fell by more than any constituency. While 75.9 per cent of eligible voters showed up for Lisbon II, only 54 per cent showed up on Thursday. -1.37 per cent – A tale of two Tipps. While the overall national turnout trend meant all 43 constituencies saw voting levels drop off, Tipp South’s turnout remained the closest: the 53 per cent mustered this week was closest to the 54.3 per cent from October 2009. Email “In numbers: Ireland's referendum on the Fiscal Compact”. Feedback on “In numbers: Ireland's referendum on the Fiscal Compact”.